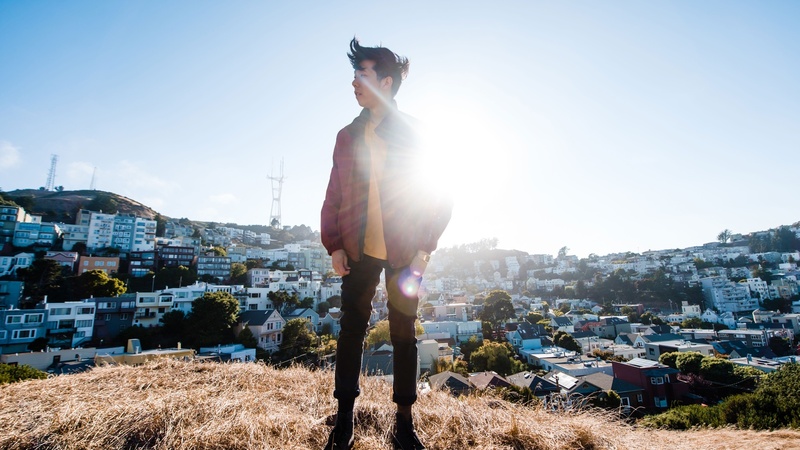 San Francisco-based producer Giraffage (Charlie Yin), whose dreamy synth-pop productions have appointed him one of electronic music’s most refreshing and innovative producers, takes a sonic leap forward with his forthcoming record, Too Real. Created over the span of two years and recorded entirely in his bedroom in San Francisco, the album chronicles the producer’s personal journey of self healing, as each song represents a different period in his life. Luckily for Yin, his success raced ahead at light speed following his 2013 Needs mixtape, a release that showcased his versatility as a producer and “omnivorous music lover,” as noted by Pitchfork. It wasn’t until his world tour supporting Porter Robinson—an experience he considers one of the most pivotal points in his career—that he was able to see the panorama of his rapidly growing fan base. He continued touring with names like Phantogram, Flume, and XXYYXX; until dropping his No Reason EP with Fool’s Gold in 2014, his first release of all-original, sample-free productions. Since then, Giraffage has continued to tour and play major international festivals while writing his forthcoming LP, Too Real. The album takes sonic and stylistic cues from such groundbreaking acts as Yellow Magic Orchestra, Haruomi Hosono, Soichi Terada, Interpol, and Radiohead. We are thrilled to welcome Giraffage to Metropolis from the middle of his North American tour. Don’t miss this exclusive mix and his live set at The Fonda in Los Angeles on Wednesday, November 29th.